Please call 408.294.3138 or email mail@jamsj.org for questions. JAMsj annual vintage sale has always been a great place to find gently used traditional Japanese ceramics, tea sets, art, vases, kimonos, dolls, and those unique items you cannot find anywhere else. It is also a great way to support the operation of the museum while meeting up with your friends and neighbors. We are looking forward to seeing you there. Children’s Day is a day set aside to respect children’s personalities and to celebrate their happiness. It was designated a national holiday by the Japanese government in 1948. It has been a day of celebration in Japan since ancient times. At JAMsj we celebrate with a Boy’s Day Doll Display and Crafts for the children. Please come join us for lots of smiles and laughs for the kids. Children 12 and under are free on Sunday May 5th, 2019. Join the Asian American Women Artists Association and Japanese American Museum of San Jose for a multimedia exhibition featuring 9 local and national artists inspired by the rich history of Japanese American agricultural crafts, legacies and present-day community placemaking. Artwork will include paintings, sculptures, films and multimedia installations inspired by a diverse range of subjects including artists’ own family farms along the west coast, local activities such as strawberry picking, agriculture-related mythological figures such as the Goddess of Rice and kitsune (fox), the contemporary relationship of farming labor practices and eco-justice, and the agricultural connection between Japan the Americas. Agrarianaa artworks will be in dialog with the permanent collection of the Japanese American Museum of San Jose, which chronicles more than a century of Japanese American history. The opening will feature a participatory art piece from Ginger Brooks Takahashi, along with food, refreshments and more. Learn more about the exhibition at the Agrarianaa Exhibition page. Admission to the museum will be free for the opening reception. This exhibit was made possible by a generous grant from Midori Kai. Hinamatsuri is a Japanese spring festival celebrated by families who have girls, wishing their daughters good health and growth. Beautifully handcrafted traditional dolls representing the emperor, empress, attendants, and musicians were displayed for honor and posterity. Come to JAMsj to experience this seasonal Japanese tradition! Admission to the museum for kids 12 & under is free! Tickets: RSVP required. Free tickets. 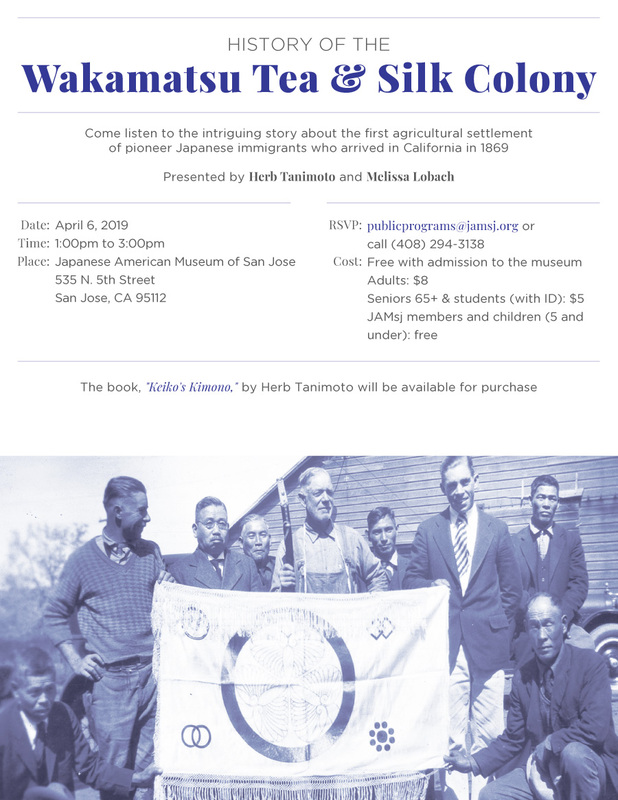 Join JAMsj in exploring the meaning of Day of Remembrance and the relevance of what Japanese Americans have learned from the World War II mass incarceration experience for understanding what is happening today. The event will feature a discussion moderated by Rose Aguilar, host of “Your Call,” a public affairs show on NPR affiliate KALW 91.7 FM with panelists from Chinese, Mexican, Muslim, and other communities who will add their own experiences to that of Japanese Americans. Be sure to join us after for the Day of Remembrance commemoration at 5:30pm at the Buddhist Church. Karen Korematsu of the Fred T. Korematsu Institute and Zahra Billoo of the Council on American-Islamic Relations will lead a panel discussion of what "Speaking Up!" means for students and citizens in today's world. The Fred T. Korematsu Institute will provide an instructional kit to all teachers who register in advance and attend the event. This instructional kit includes a K-12 Korematsu Institute Teacher’s Guide, videos and accompanying lesson plans, and posters. Kits give you access to digital materials, including the entire Korematsu Institute Teacher's Guide and additional lesson plans on five documentaries on the Japanese American incarceration. RSVP is highly recommended to secure a seat by emailing publicprograms@jamsj.org or by calling 408-294-3138 by January 20, 2019. Plus many more prizes from artists and merchants. Winners need not be present at the time of the drawings. The public is invited to participate in a screening and panel discussion of the new documentary film, “For the Sake of the Children,” on October 28 (Sunday). The community event will be held at the San Jose Buddhist Church Betsuin at 640 North Fifth Street, in San Jose’s Japantown at 4pm. The Poston Community Alliance is co-sponsoring the documentary with Midori Kai, Inc., San Jose Buddhist Church Betsuin and the Japanese American Museum of San Jose. Poston was one of ten concentration camps that imprisoned more than 120,000 Japanese American citizens and Japanese immigrants living in California, Oregon and Washington State following the attack on Pearl Harbor. Their incarceration was authorized by President Franklin D. Roosevelt through Executive Order 9066 signed on February 19, 1942. The film’s executive producer, Marlene Shigekawa, was born in the Poston Concentration Camp near Parker, Arizona and is president of the Poston Community Alliance. “This project began in 2012 as an outgrowth of my own family’s incarceration at the Poston camp and the traumatic impacts from that experience which have resonated throughout my entire life. As I delved deeper into my own story, I connected with four generations of descendants as well as families from the other camps whose stories also needed to be shared,” Shigekawa explained. Initially conceived to focus specifically on mothers who gave birth to and raised children while incarcerated at Poston, the documentary was eventually expanded to include family stories from other camps after the Alliance received a grant from the National Endowment for the Arts. Previous screenings have been in Los Angeles, New York, San Francisco, Missoula, Montana, Fresno, Sacramento and Larkspur. Shigekawa produced the film with director Joe Fox and Directors of Photography, James Nubile and Sean Dolan of Fly on the Wall Productions. The Poston Community Alliance works to preserve the stories, artifacts and historic structures of the concentration camp. The Alliance is currently leading an effort to stabilize original classrooms at the Poston Camp I Elementary School site and create a visitor center. For more information about the film and the Poston Community Alliance, visit www.forthesakeofchildren.org. Panelists joining the post-screening discussion will include Patty Tsubokawa Reeves and Stephanie Gillman, cast members, and Zahra Billoo, Executive Director of the Council on American-Islamic. The moderator will be Robert Handa, news reporter, NBC Bay Area News. There is no admission fee for this screening although RSVPs are requested. 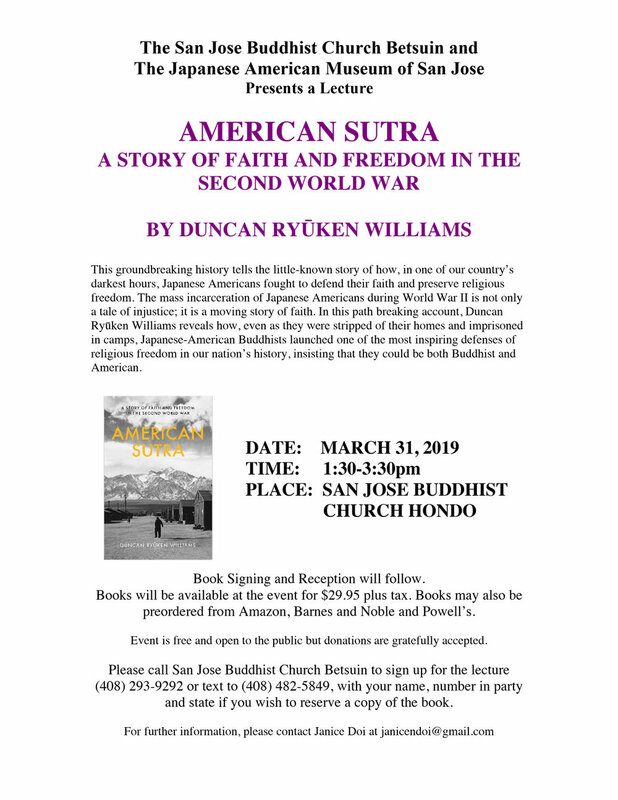 Donations for the screening will be accepted and benefit the four sponsoring organizations: Poston Community Alliance, Midori Kai, Inc., San Jose Buddhist Church Betsuin and the Japanese American Museum of San Jose. Please text reservation to (925) 596-1770. Contact Marlene Shigekawa (510) 290-1944, for any questions regarding this event. Come and meet the author, Jeanette S. Arakawa. 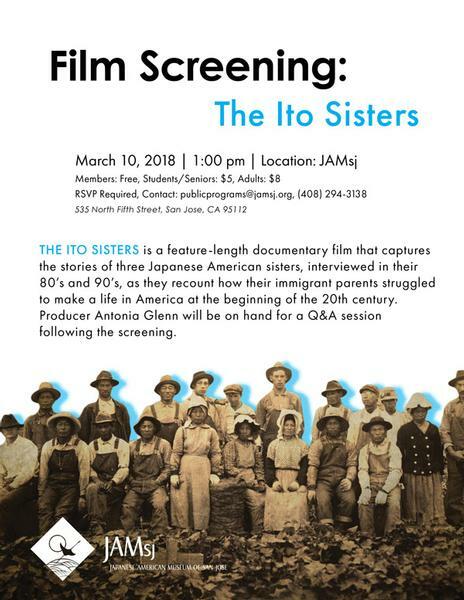 Director and producer Antonia Grace Glenn, producer and editor Gregory Pacificar and scholar Evelyn Nakano Glenn will be on hand for a Q&A session following the screening. 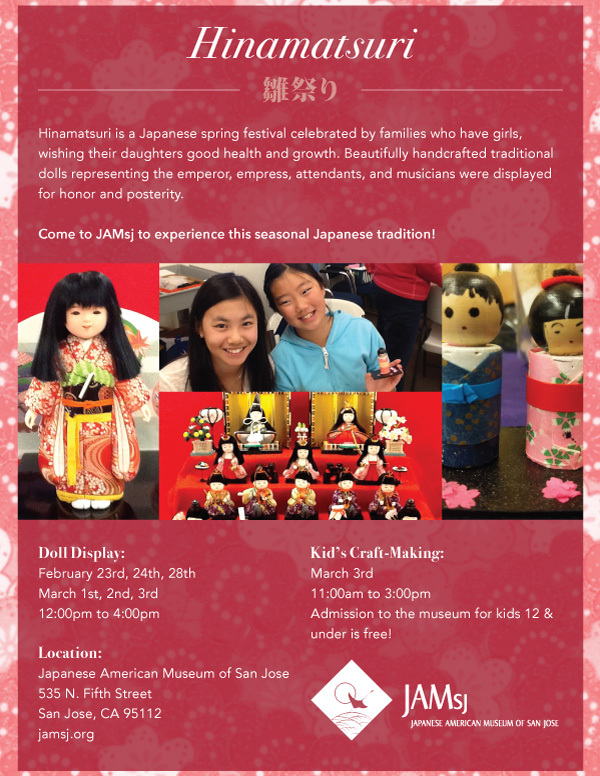 Come to JAMsj to experience this seasonal Japanese tradition! Free with admission to the museum! 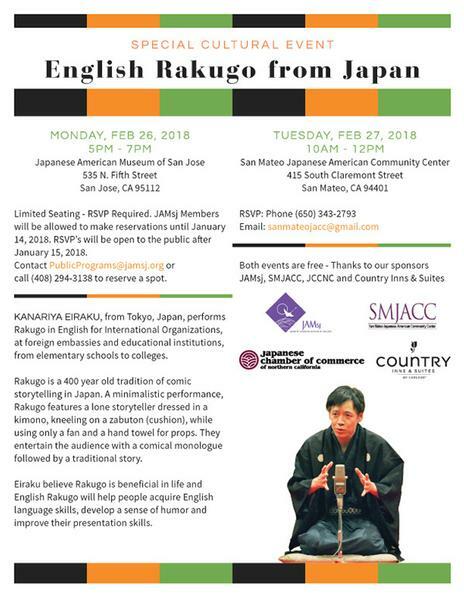 The JAMsj is hosting a presentation of the historical Kitaji Bibles which were carefully translated into Japanese and richly illustrated by Captain Masuo Kitaji, of the Japanese Salvation Army Corps in Oakland on February 17, 2018 at 1pm. To reserve a seat, contact: publicprograms@jamsj.org or call (408) 294-3138. Beyond Barbed Wire is an emotionally charged telling of a bizarre moment in America's history. The stories, poignant and humorous, recount the struggle that the offspring of interned Japanese Americans faced when they fought for America in WWII, as the Army's newly formed 442nd Division - the most highly decorated division in the Army's history. Narrated by Pat Morita. You are welcome to bring your own goodies to enjoy while watching the video. We are calling upon members of the Japanese American community to share their memories and recollections about World War II. Now, more than ever, it is crucial we talk to the relatives, friends and community members who still recall vital stories of wartime on the West Coast and being uprooted from their homes. 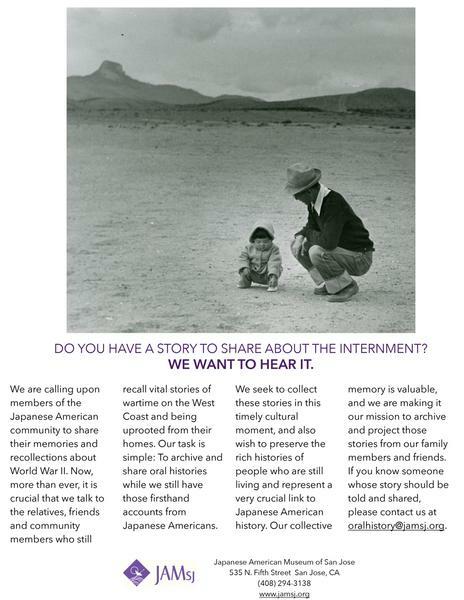 Our task is simple: To archive and share oral histories while we still have those firsthand accounts from Japanese Americans. We seek to collect these stories in this timely cultural moment, and also wish to preserve the rich histories of people who are still living and represent a very crucial link to Japanese American history. Our collective memory is valuable and we are making it our mission to archive and project those stories from our family members and friends. If you know someone whose story should be told and shared, please contact us at oralhistory@jamsj.org. Check out the stories we have on record on the Sharing the Story: Oral History page.